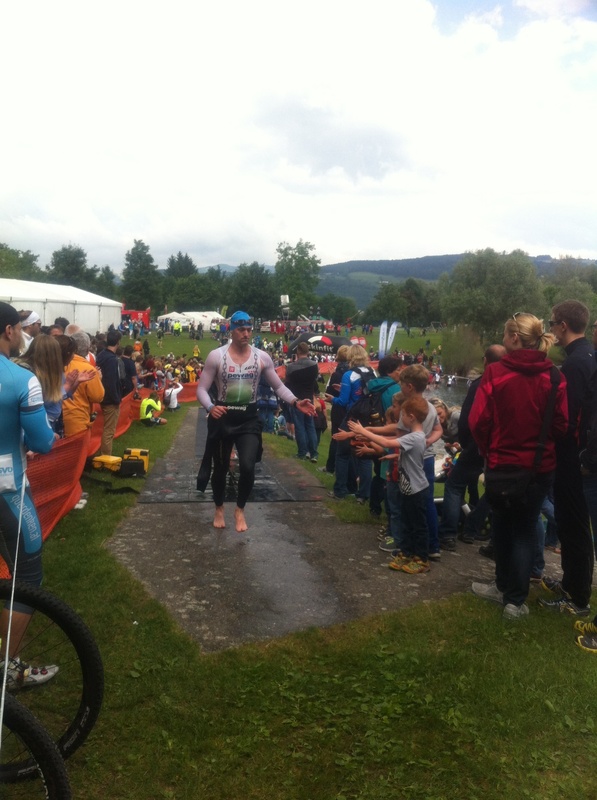 2014 LinzTriathlon () Race Report – Stefan Reiter reaches his first podium! After a disappointing swim I managed to screw up my transition a little followed by strong ride in heavy rain and finished with a very solid run. This alltogether was enough to put me on 3rd place of my AG beaten only be two professional athletes! I followed my already proven race-week nutrition consisting of some days of low-carb diet followed by a “big eating day” 2 days out of my race with high carb intake but low on fat/protein. The last day before the race I eat just a little bit more than normal but still very high in carbohydrates and low fibers, fat and protein. In addition to this I drink 4 servings of “Sponsor Carbo-Loader” throughout the day. Even though my last OWS is more than 6 months back and I’ve received a brand new swimsuit which I’ve never ever tested before my expectations were high here as I made tremendous improvements in my swim. My plan was to start out swimming “hard” for the first half lap then settling into a 80% effort with good rythm. Managed the “hard” start and but this was just fighting against the water without any sort of rythm. After the first half lap I tried to dial back but couldn’t find into my groove – struggeling with body rotation and breathing … at this point everything just felt terrible. At the end of the first lap I started to feel that my shoulders are getting sore as a result of striving against my wetsuit. Right about this time I found my groove but I also lost contact to the group of other swimmers. On the second lap soreness in my shoulders increased and as a result of that I not only slowed down a bit more but I also started to swim zigzagways (need to work on this!!). Finished the swim after 33:09 which is almost a new PR but I was hoping for a sub 32 minute swim. Started out feeling “easy” even though power was around 75-80% for the first 5k. Weather was good at this point. Started first easy but long climb passing a huge number of competitors already but kept my power around 90%. Nutrition plan started at the 20′ mark with gel and half-powerbars in alternation every 20′(after gel) / 30′(after bar). 20k into the first lap the rain set it and at the point where all the nice fast and curvy downhill section starts we had incredible strong rain with A LOT of wind and terrible gusts. We even had some hail at that point . Second lap was pretty much a copy of the first one with all that rain, wind, gusts and all the other nasty stuff. The only difference here was that there weren’t a lot of people around me. 20′ out of T2 I dialed back my power output to 75% to prepare for the run. Not a lot of things to screw up here but again I managed to loose some seconds here … got confused by my 910xt telling me to start biking after I hit the lap button … still trying to that the Garmin-mess-thingy straight again I found the transition area to be on a different location than prescribed at the check-in which resulted in some additional meters. So as I said before – no big issue but also some small issues add up to some seconds in the end. Although I peed 1x on the bike I had to stop for another pee-break at the 2k mark loosing another 30-40sec here. The rest of the run was just unwinding the EN pacing plan an following my nutrition plan for the run (1xgel @7k, 1xgel @13k + a cup of iso and a cup of coke). Finished the run after 1:28:50 with a strong 2.5k final push (pace below 4:00/km). After checking results I found out I lost at least 3 places just with my awful transition . Only 20sec faster and I would have been 7th overall … damn thing. – learn to swim STRAIGHT!! – always prepare transition area for rain even if it’s sunny and no clouds are out there in the sky!! 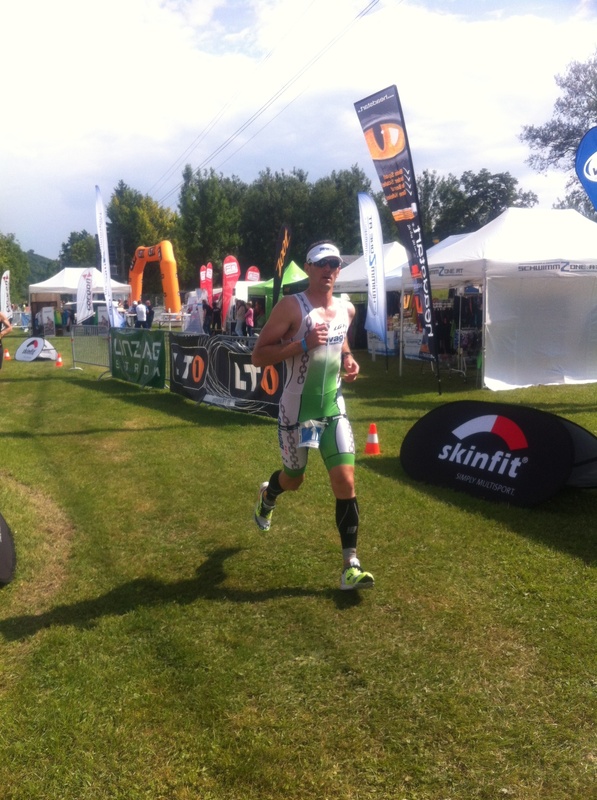 – always have a dry towel in transition area! !